A complete Royal dinnerware set from Royal China Company is definitely a find. This company was located in Sebring, Ohio and is remembered for producing some pretty awesome dinnerware patterns. The company produced pottery and dinnerware from the late 1800s to the 1980s. According to the Sebring Ohio Historical Society, the company started in 1898 under the name of Oliver China Company, was renamed E. H. Sebring Pottery Company, and finally Royal China Company which came into existence in 1934. For more information about the company, their patterns or back stamps, I recommend visiting the website of the Sebring Ohio Historical Society. They have done a good job of keeping remembrance of the company and their productions alive. Dinnerware patterns by Royal China Company are countless. You can find a lot of them through the page links that are on the Sebring Ohio Historical Society website. There are a few collector clubs. This is a good place to hook up with other collectors and find out more about a pattern that you are interested in. One of the most popular dinnerware lines by Royal China Company is called Currier and Ives. The Americana patterns feature scenes from life in America through transferware. 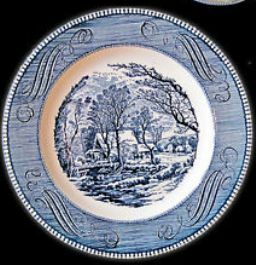 Blue transferware was well-liked at the time of the production. Currier and Ives also presented multi-colored transfers along with pink, brown, black, and green. Willow patterns of transferware were also produced by Royal. I'm particularly fond of the Colonial Gold pattern. I actually had a plate of the pattern that I purchased long ago at a yard sale because I liked it. It has gold trim and features a colonial couple that is thought to be a picture of George and Martha Washington. I had it in a plate hanger and used it for decoration. Royal China Company was in business for a long time and went through several ownership changes. The back stamps of dinnerware produced by Royal China Company vary and many different versions have been used throughout the years. .
Vintage dishes from Royal China make a great collection. In the later years of manufacturing, Royal China produced a collection of pie plates. 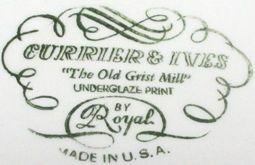 Some of the back stamps say "Royal China by Jeanette" which makes me think that that these were produced after the company was sold to Jeanette Glass Company. The pie plates are pretty cool because the recipes for certain pies are printed on the pie plate. 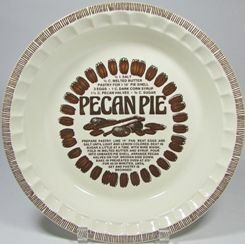 I remember my mother having a pecan pie plate with the recipe in the center. I didn't know it at that time, but it was a Royal China pie plate. I would like to start a collection of the vintage Royal China pie plates and use them for kitchen decorations. When it comes to holidays, my mother and I are usually the pie makers. My mom's well known for baking pecan pies for everyone and my pumpkin pies are my sons' favorite. Most of these are from the Country Harvest Series. Some of the rare vintage pie plates produced by Royal China include Armadillo Pie (I don't know about that), Lorraine Quiche and Pizza De Casa. I would love to have all of these plates. A Royal dinnerware set and vintage dishes manufactured by Royal China Company are definitely collectibles. The American dinnerware company is known to produce dinnerware made in the USA, which is a plus in my book.